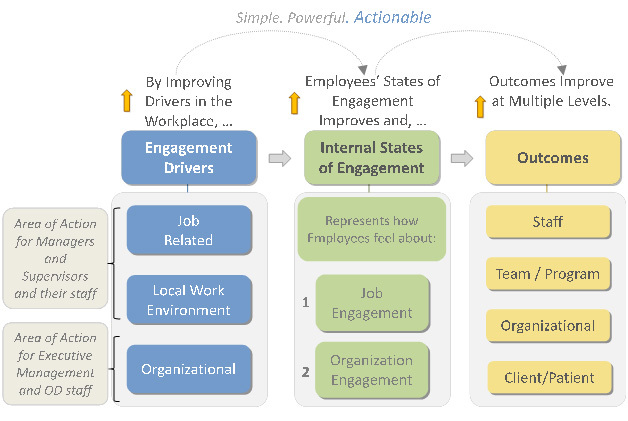 The Metrics@Work Model of Engagement was developed and refined over a period of several years through the synthesis of academic and real-world insights, and is the foundation of our uniquely deep understanding of the theory and practice of employee engagement. Based on common sense logic, our Engagement Model is designed to be easily understood yet produce powerful results. This differentiation is a key advantage to working with Metrics@Work as it is clearly linked to our surveying and also to your reporting. This means you can clearly define where better practices (i.e., higher scores) are occurring, but also where challenges lie (i.e., lower scores).